Our trouble in pinning down Elmer’s motives makes for an uneasy piece of reading, but this makes it generous too. He feels no need to justify what he does; he is a child after all, a fact that’s always present yet easy to forget. What prevents him from coming off as a total sociopath is that adult logic is equally inscrutable, e.g., Werther’s mother always trying to cop a feel of her own child’s friends. Elmer appears in a softer light if everybody else is even more warped, which Gerard Reve seems to think is the case. 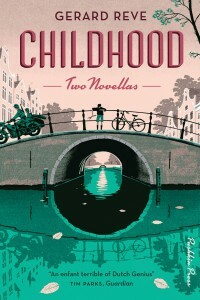 With regard to theme, The Fall of the Boslowits Family is close to the first novella, only a tad less profane, and as a setting, the Nazi occupation of Amsterdam has higher stakes. Upon first hearing of an invasion, the young narrator says, “What I’d like most would be violent skirmishes here in the streets of the city. . . Shooting from door to door, with hand grenades and white flags; but only for a day or two, otherwise it starts getting boring.” When family friends the Boslowitses risk imprisonment, his daydream quickly falls apart. The story’s moral core—something nowhere to be found in Werther Nieland—in no way feels imposed from without. Rather, The Fall of the Boslowits Family depicts the formation of a young boy’s conscience through the necessity of circumstance. Again, the stakes are higher. I’m sad to confess I read no Dutch. Nevertheless, I’m confident enough in the reputation of Pushkin Press to take for granted that the translation is good. What I can say is that the English was stripped to the bone, burnished and whetted to preserve the sharpest possible edge. The four family members narrate the story alongside several tourists grouped under a single voice, “The Tourist”: a businessman with the libido of a teenager and a seven-year-old girl from Medellín, among others. In brief and well-constructed soliloquies, the collective character explores the psychological traits of the main characters, allowing González to switch between first and third person. During the past decade, González’s position in Colombian literature has been radically transformed. Once one of its “best-kept secret voices”, he has become one of the country’s most distinguished writers. 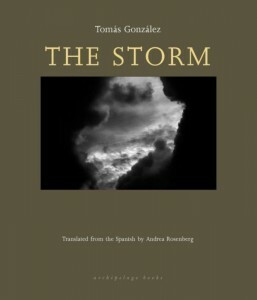 In The Storm, González returns to some of his recurrent themes: the sea, psychological turmoil, and family relationships. If there is one element in which González’s contemplative and austere prose shines brighter than ever is in his approach to the metaphorical plurality of the storm. The symbolic associations of the storm are dealt in a myriad of registers: from the contemplative description of the actual storm, the detailed psychological frictions erupting on the boat, to the lyrical demons inside the mother’s head. In Andrea Rosenberg’s translation, the author’s stylistic traits—short and pointed phrases, poetic descriptions and poetic monologues—shine and linger in the reader’s ear. Rosenberg’s translation reproduces the original cadence of the character-driven narrative with ease and precision, allowing the reader not only to give in to the gripping pulse of the story, but also to perceive the sociological examination of regional stereotypes and narrative idiosyncrasies that González conducts through his characters. Just as González’s style examines the way in which macho dynamics, family grudges, and religious devoutness are asymmetrically performed and narrated throughout the country in a delicate manner, Rosenberg’s translation preserves the cultural nuance and linguistic accuracy of the original prose. After the success of the translation of In the Beginning Was the Sea (Pushkin Press, 2015), González’s first book translated into English, The Storm arrives as a welcome addition to the international recognition of one Colombia’s most prolific and poetic writers. 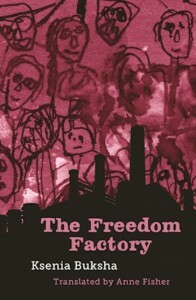 Frankly, it is not hard to understand why The Freedom Factory, written by Ksenia Buksha, won Russia’s National Bestseller award in 2014. The novel, based on interviews of real-life workers from a Soviet military factory, is translated here from the Russian by Anne O. Fisher, so readers of English will have the privilege to appreciate the fluidity and profound humanity of this book. Born in Saint Petersburg, Ksenia Buksha is a poet, fiction writer, and artist. In her generous project The Freedom Factory, we are able to enjoy all these skills at the same time: compelling poetic images, talented fictionalized storytelling, and minimalist illustrations verging on the abstract—is this to counterbalance our expectations of realism? The artwork accompanying characters throughout the book evokes both the innocent world of childhood and the aesthetics of disenchantment—both the simplicity of dreams and a potential for nightmares. In that respect, the illustration on the book cover aptly announces the kind of universe readers are about to enter. Meanwhile, in the factory, weapons are built, cancer cured—or so it seemed, if we are to believe our narrators’ voices: “It’s a true story, you can Google it if you want.” You may not want to do this, though, because that’s the power of such a multi-layered book: the fiction, through poetry and skillful narration, may tell you more than you’ll find in a documentary. 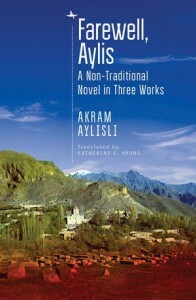 Farewell Aylis, as the full title suggests, consists of three works: Yemen—a story, Stone Dreams—A Novel-Requiem, and A Fantastical Traffic Jam—A Novel-Requiem. Perhaps the dedication of the book by Aylisli to a place and not to a person or people tells us all we need to know about the book: “Dedicated to the days and nights of Aylis, for which my soul bitterly weeps.” One cannot, however, really say that the book is filled with nostalgia for Aylis and its good old days or its glorious present, despite the fact that nostalgia plays a key role in the stories; because, as Aylisli shows us, the old days are not that good, really, and the present too is humanly gray and complex and sometimes even terrifying. So yes, one wants to “bitterly weep” when inhabiting the world that Aylisli invites us into, weep for the ugliness and the beauty of the human soul, for the burden of history and its shadow forever redefining the present of a place and its people, and for those who strive to survive above and beyond. Set in a region where different languages, cultures, religions, ethnicities, and nationalities are tightly intertwined, and sometimes in horrifying tension, the stories come to life through seamless weavings of various layers of memories, dreams, deliriums, rumors, folktales, and realities. For example, in Yemen, visiting a resort where he used to spend time with his wife, the protagonist, Safaly muallim, remembers his trip to Yemen, where in a garden he once remembered his childhood village and Bukhara. In Stone Dreams, we learn of the life story of the protagonist Sadai Sadygly while he lies unconscious in a hospital bed, through the conversations of the doctor and the man who has brought him in and through his own travels in time and place in his comatose state. In A Fantastical Traffic Jam, the story of the omnipresent tyrant is also interspersed with dreams, delirious visions, rumors, poems, a book that people in a library keep asking for, and a diary. All three stories in one way or another touch upon the role and struggles of artists, writers, and poets in societies stifled by power-hungry officials of “glutinous regimes” and their followers. This presence of writers is multiplied, in both Yemen and A Fantastical Traffic Jam, by the metafictional aspect and the presence of the authorial voice that draws us even further into the world of the stories. Reading Farewell, Aylis is like sitting by the fire at night with the older men of the village and listening to their stories, which in truth are the oral history of a people and a region, which in truth could turn out to be prophecies of our own lives. Reading them as an Iranian also has the extra appeal of traveling deeper into a place that, both geographically and metaphorically, is so close to home, and finding joy as well as sorrow in knowing words, names, foods, places, etc., as well as that feeling that you know that character, that situation, that fear, that solidarity. Following the publication of Stone Dreams, which addresses the massacres of Armenians by Azerbaijanis, the Azerbaijani Aylisli (born in 1937) faced many hardships, including the burning of his books. He currently lives under de facto house arrest in Baku, Azerbaijan. The book is beautifully translated from the Russian, not the original Azeri, by Katherine E. Young. 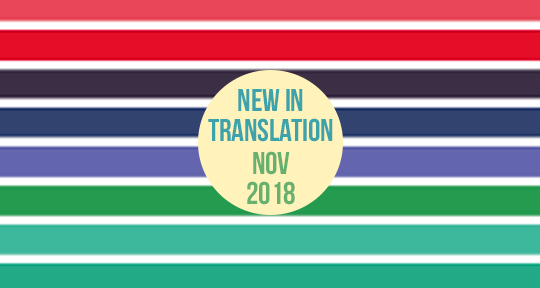 To learn more about that and other aspects of the translation process, you can read Young’s interview with the NEA Arts blog. You can also find another translation by Young, of poems by Ukrainian poet Iya Kiva, in Asymptote.